(“The Anarchist” by David Mamet plays at the Eureka Theatre through January 17, 2015). 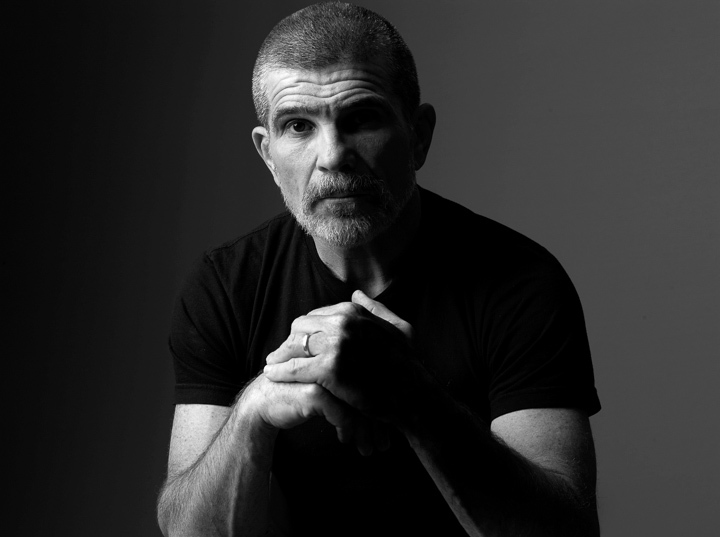 Pulitzer prize winner David Mamet is one of America’s leading and most controversial playwrights. Photo Credit: Brigitte Lacobe. Theatre Rhinoceros has given David Mamet‘s two-hander, “The Anarchist”, a carefully considered, well acted west coast premiere. John Fisher’s direction is precise and intelligent, and the two actresses (Velina Brown and Tamar Cohn) have served the text well. But it is a damned difficult play to understand, let alone enjoy. Two women: one serving a life sentence for a murder committed in the context of a political upheaval, the other her jailer who must recommend to a parole board whether or not the prisoner should be released. The play is set in an office where the jailer interviews the prisoner just before going before the Parole Board who wait in an adjoining room. There is limited time for the jailer to decide on her recommendation — the telephone rings repeatedly with messages from the Board that they are anxious to finish this business. While the prisoner desperately tries to convince her jailer to recommend release, the jailer is determined to maintain a judicial indifference in an effort to make the wisest choice. 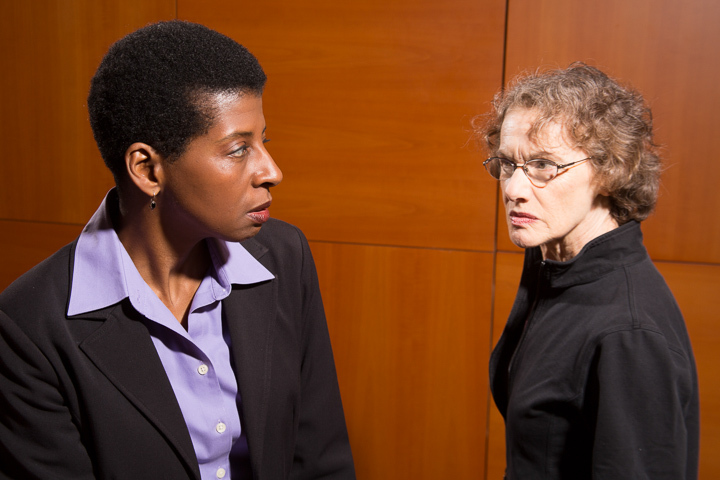 From l to r: Velina Brown as Ann and Tamar Cohn as Cathy in Theatre Rhinoceros’ west premiere of David Mamet’s “The Anarchist”. Photo Credit: David Wilson. As they spar with one another in language that is rich with implication, rhythm, repetition and intrigue (qualities typical of Mamet’s always skillful writing), various complications of emotion, history and political analysis come up for dissection. The result is about 80 minutes of theatre at times engaging (more intellectually than emotionally) and at times soporofic. I feel as if I’m reviewing two different plays: one of them exciting with intellectual and emotional fireworks; the other overly wordy, confusing and dull. In the end, it is hard to say which play won out, but I was glad to have attended. Tamar Cohn, as Cathy the prisoner, unabashed lesbian, and perhaps former anarchist, does her very considerable best with this material. She fills the stage with memories and passion, switching strategies in rapid succession, trying to find the vulnerabilities in her adversity (including, perhaps, an unacknowledged sexual attraction) that might win her release. Velina Brown is equally good in the role of her jailer, Ann, craftily setting a trap that surprises us when it is sprung near the end of the play. It is a testament to the actresses’ skill that throughout their debate, we remain in doubt as to what will be said at the hearing. This west coast premiere of a work by an important American playwright will be of interest to committed Mamet fans and those who particularly appreciate political content onstage. Others may find it rough going. For further information, click here. “The Anarchist” by David Mamet, a west coast premiere produced by Theatre Rhinoceros. Director: John Fisher. Scenic/Lighting Designer: Jon Wai-keung Lowe. Costume Designer: Christine U’Ren. Ann: Velina Brown. Cathy: Tamar Cohn. Posted in Reviews.Tagged Charles Kruger, David Mamet, John Fisher, San Francisco Theatre Reviews, storming bohemian, Tamar Cohn, The Anarchist, Theatre Rhinoceros, theatrestorm, Velina Brown.